And if you aren’t? Consider yourself warned. Actually, using this TV-ad version of a pick-up line in the service of selling a sentimental riff on second chances based on a series of popular YA books by author Heidi McLaughlin isn’t an entirely bad idea. That’s because the Sparks brand of big-screen adaptations was officially snuffed out in 2016 after No. 11, “The Choice,” collected a measly $19 million in ticket sales. 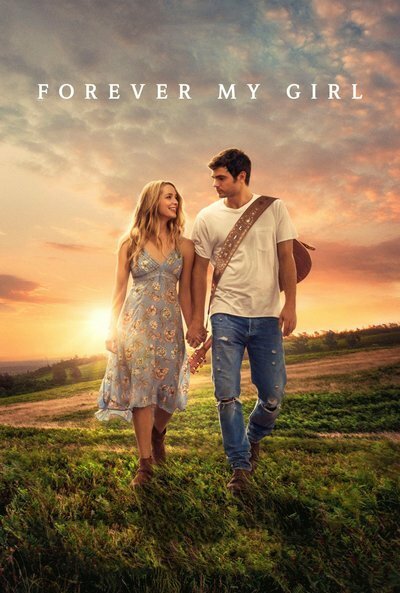 Therefore, one can’t exactly fault the makers of “Forever My Girl” for taking advantage of the void left in the cinematic universe for lovey-dovey schmaltz dressed up with family-values messages. Certainly, “Forever My Girl"'s overtly predictable plot has more logic than any outing that takes place in what I like to call Sparks-landia, a sort of hybrid Harlequin romance-“Twin Peaks” bizarre-o world where kisses only happen when the spit-swappers are drenched with water, youthful flashback versions of characters look nothing like their older counterparts and tragedy is most likely to rear its head just as complete and utter happiness is within reach. This yarn about Liam Page, an obscenely coddled country superstar (Alex Roe) who left his high-school sweetheart and fiancée Josie (Jessica Rothe) high and dry at the altar eight years ago while fleeing small-town Louisiana doesn’t traffic in drippy kisses, crazy coincidences or worldly-wise geezers. Instead, it is as bland as a mayonnaise sandwich on white bread—after someone forgot the mayo. It is a movie where a lot seems to happen but it adds up to nothing much. Still, writer/dirctor Bethany Ashley Wolf has her own non-Sparks oddball plot points to contend with. That includes Liam’s precious battered Nokia flip phone that contains Jodie’s final message from years ago—one he never replied to—that takes up a goodly chunk of the running time. Also, grief over the loss of various departed loved ones and guilt over bad choices past and present drive the actions of the leads far more than any sense of re-ignited passion. While Wolf makes an admirable effort to populate the fictional Southern burg with a number of people of color, none of them are allowed to contribute in any meaningful way to the action. That includes what leads Liam to go back and finally face the music as well as Josie’s wrath in the form of a literal punch to the gut. While watching the local news after a New Orleans concert, he learns that his best buddy from high school—who happens to be African-American and a councilman—has died in an accident. His desire to attend his pal’s memorial might be sincere, but it feels more like an excuse to take a break from the pressures of fame. Liam is even too chicken to truly participate in the service, presided over by his pastor father (seasoned actor John Benjamin Hickey, a welcome counter-balance to the lesser knowns in the cast) who initially is not pleased to see that his prodigal son has returned. But what is most confusing about the direction the plot takes is that instead of trying to woo Josie back, Liam invests most of his efforts into winning over her Code-Red-level precocious seven-year-old daughter (Abby Ryder Fortson of “Ant-Man”)—especially after doing the math and learning her name is Billie (Liam is Irish for William). Duh, of course, she is his kid. It is somewhat sweet that he starts making up for lost daddy time and is thrilled that Billie has inherited his talent for guitar strumming. But it feels like an eternity before actual romance enters the picture. Instead, fear of pet rabbits, the need for a child-size car seat and the ins and outs of ordering items online are dealt with. And, despite her protestations that she got along just fine without him, and even owns her own florist shop and everything, Josie is pretty much a pushover, despite whatever emotional speed bumps might crop up along the way. Not having read the book that "Forever My Girl" is based on, I have to trust the upset online fans who are peeved that Liam is no longer a bad-boy rocker and Josie is now a blonde instead of a brunette. Also at issue: Their child was originally a ten-year-old son. But Rothe—not used to full advantage here—has a certain star quality and can sing and dance, which you would only know if you saw her as one of Emma Stone’s roommates in “La La Land.” Roe is quite a doll, chest-hugging T-shirts and all, and has a good-enough voice to carry the not-bad original songs on the soundtrack. Besides, Travis Tritt kindly puts in a cameo and Blake Shelton is name-checked. Still, there is more pleasure to be had in the dwindling returns of CMT's “Nashville” than in this country soap-opera.